Plastic is everywhere. It’s in the clothes we wear and the cars we drive. It holds and protects the food we eat and beverages we drink. We can’t get through a day without using plastic in some way, shape or form. And its ubiquity is part of the problem. “Many plastics are found in single use items, and there are disposal issues,” says IonE resident fellow Marc Hillmyer, director of the Center for Sustainable Polymers and Distinguished McKnight University Professor in the College of Science & Engineering. Most plastics do not easily degrade and thus “can’t be discharged safely into the environment. Moreover, most plastic is not recycled, and there is serious concern about how much plastic ends up in our oceans,” he says. 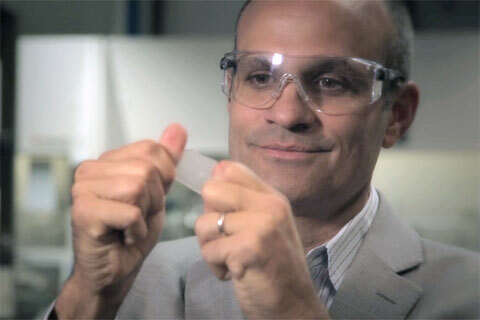 Professor Hillmyer demonstrates the physical properties of a new sustainable material created at the Center for Sustainable Polymers. Photo by Chuck Olsen, Vidtiger. CSP, which has received support in the past from IonE’s Initiative for Renewable Energy and the Environment, was recently awarded a $20 million grant from the National Science Foundation to continue its comprehensive work making plastic more sustainable. Polymers, the molecules of plastics, are long-chain compounds that can readily entangle with one another in the solid state. This entanglement is largely responsible for both the strength and durability of plastics. The mission of CSP is to facilitate the use of waste and other biomass as the feedstocks for polymers that can be fashioned into useful products but that can also be composted or safely incinerated at the end of their lives. “We want to make polymers with cleavable junctions that still have high performance,” says Hillmyer, whose team is developing bio-based plastics from inexpensive materials like sugar that can be used in, for example, adhesives, shoe soles, car parts, foams for seats and fibers for clothing. CSP integrates researchers from diverse backgrounds and multiple disciplines who collaborate on every step of the process, including chemistry, chemical engineering, polymer processing, metabolic engineering and materials science. CSP also supports outreach and education programs. To reach the next generation of scientists and broaden participation of underrepresented minorities, CSP partners with groups like 4-H, SciGirls and St. Paul Public Schools.